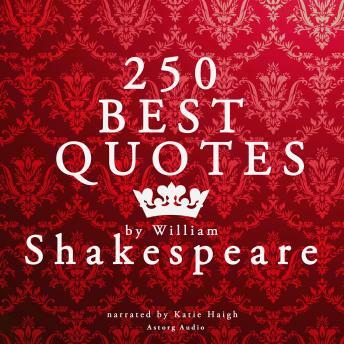 Shakespeare is regarded as the greatest writer in the English language and the world's best dramatist. His plays have been translated into every major language, and are the most performed ever. His work contains stunningly modern insight, witty jokes and soaring passion; it is an endless source of amazement and inspiration. We have selected for you the best quotes ever written by one of the greatest literary figures to have ever walked on earth, from Hamlet to Macbeth, Romeo and Juliet to the Tempest, and from every other play in existence: Othello, King Lear, and the historical dramas, Henry IV, Henry V, Henry VI, Julius Caesar, Henry VIII, King Lear. Enjoy the force and passion of this fondation of literature and culture; get to know the Bard more intimely as you gain food for thought and enjoyable references.